Carol Dilley, associate professor of dance and director of the dance program at Bates College, has received an artist residency to produce a dance project in Newcastle, Australia. In July and August 2010, Dilley will be resident artist at the Lock-Up, a cultural center first built as a jail in 1861 and used for that purpose until 1982. When she begins her residency next August, she will choreograph dances that take advantage of that unique space and also reflect on her past work at Bates and abroad. Prior to starting at Bates in 2003, Dilley spent more than two decades studying, performing, choreographing and teaching in locations around the world. 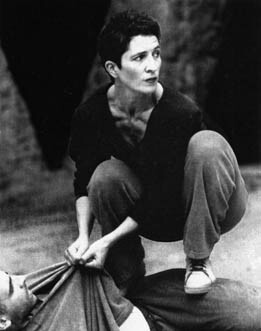 Her experiences from Sydney to Maine have enabled her to teach all levels of dancers and all manner of styles. The Lock-Up’s programming celebrates Newcastle’s culture and heritage. The residency will be Dilley’s second there. The first took place in 2008 when she created a video installation, including music and footage by Bates music professor William Matthews, that was projected onto the prison’s concrete walls. The text continues below the video! “To see images of the intimate relationships of dancers, birds, fields, theaters and oceans projected on the walls of a prison yard was amazingly powerful — the very essence of freely expressed human interaction trapped on these very unnatural walls,” she says. The strength of that installation encouraged the Lock-Up to invite her back for a live performance. Dilley will enlist two groups from Australia to bring her choreography to life. One group participated in a class Dilley taught during her first residency. The other is from Sydney, where Dilley was active in the dance community for 15 years. Dilley will choreograph both duets and group dances that exploit the prison architecture: The duets will be performed in cells that once housed two prisoners, the group pieces in the exercise yard. The residency will be the fourth installment in an evolving project combining dance and video. Described by Dilley as an “international development,” this project started as a live duet at Bates that was recorded, deconstructed and later shown as a video installation at the college. Dilley further developed the installation for her 2008 residency in Newcastle, and will create dance work and video directly based on what she learned through the installation process. Dilley sees this as an example of how “research begets research,” as concepts in a work multiply and build upon one another. For Dilley, the residency is an opportunity to both focus her energies towards one complex goal and to maintain an understanding of dance in other parts in the world. “The time to go away and concentrate on making a piece with experienced dancers in a unique historical site is a research prospect I’m eagerly looking forward to. The creative resources I will acquire there will last me for many years to come,” she says.